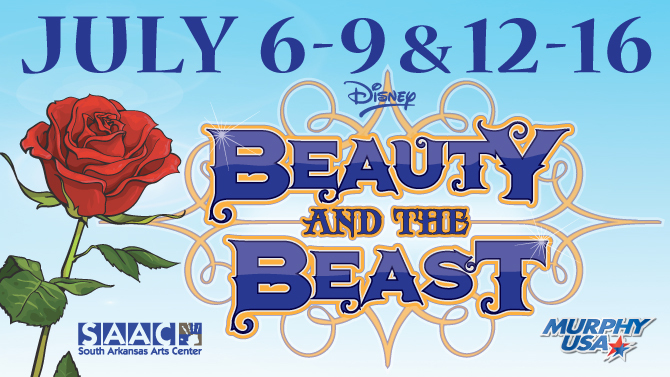 SAAC is proud to welcome Christopher A. McCroskey to his hometown stage as musical director for the summer production of Disney’s Beauty and the Beast. Auditions for the production will take place on Friday, April 7 at 6pm and Saturday, April 8 at 10am. SAAC will be open on Thursday April 6 from 6-8pm for auditioners to register early, and Chris will be on hand to speak with people about their music selection. Also this summer, Chris will give a concert on Saturday, June 3 at 7pm at SAAC, as well as be available for piano lessons and some fun and educational events. Chris has had experience in the past with Disney’s Beauty and the Beast, having served as musical director for a production of the show in Columbia, South Carolina. He loves the theme behind the show and thinks it is a beautiful and fun show to produce and be a part of. “Love conquers all is something we should all pay attention to and learn from. I love the idea of accepting people for who they are and not what they look like. It’s important to see the good in everyone,” he said. Why does McCroskey want to return to El Dorado for this spectacular production? “SAAC was instrumental in my musical life, and this summer is all about giving back,” he said. “My parents dragged me to see my sister perform in A Funny Thing Happened on the Way to the Forum. The overture began, and I was immediately completely absorbed! I went to see the show 4 or 5 more times- I was hooked on musical theater, and it has continued my whole life.” Chris is very excited to be returning to his home-town for the summer as the Artist in Residence at SAAC, and looks forward to inspiring some new musical theatre buffs in the making. McCroskey is the son of Nancy and Adrin Hargett and Otis and Linda McCroskey. His musical interest began at a very early age; as an infant, he heard his mother giving private piano lessons in their home. Chris began formal piano studies with his mother at the age of 4, reading the notes on pages of music before he could read their titles! 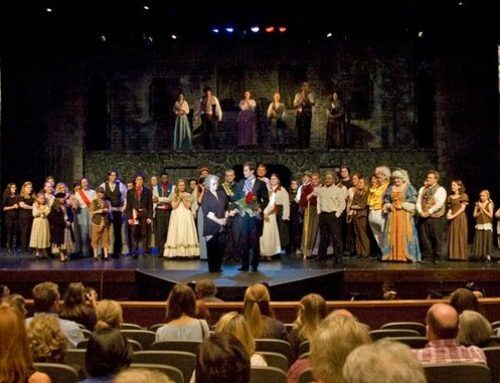 At 14, he performed his first musical theatre production at the South Arkansas Arts Center. He continued to play for shows there until he graduated from El Dorado High School. At 15 he began teaching private piano lessons. In 1979, Chris also performed his senior high school recital at SAAC. A few years after starting lessons, he began formal piano studies with Mildred Norris who taught him throughout high school. He was very active in the choir and band throughout junior high and high school. After graduating from El Dorado High School, Chris won first place at the Centenary College Hurley School of Music Piano Competition in Shreveport, Louisiana, and received a piano scholarship. He was also awarded a music scholarship as the accompanist for the Centenary College Choir. After graduating from UGA in 1985, Chris returned to El Dorado and taught private piano lessons as well as being the organist at St. Paul’s United Methodist Church. He was also the pianist for the South Arkansas Symphony. During this time, he wrote an original score for a production of Wait Until Dark at SAAC. Chris was also an adjunct professor in music appreciation at South Arkansas University, El Dorado Branch. At SAAC Chris was involved in Oliver, Fiddler on the Roof, Mame and Annie, Get Your Gun. He also has continued to work in community theater in Columbia, South Carolina, as well as other venues across the country. In addition to his musical career, Chris was also a Human Resources Specialist for AgFirst Farm Credit Bank in Columbia, SC from 1997-2015. Since retirement, Chris is substitute teaching as well as being very active in musical theatre and many other music venues, often as a solo piano accompanist. Chris is a member of the National Guild of Piano Teachers and has acted as judge and adjudicator for many piano competitions. 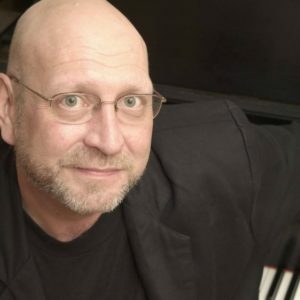 Chris holds a Bachelors Degree in Piano Performance from the University of Georgia, a Masters in Music Theory from Florida State University in Tallahassee, and a Doctorate of Musical Arts (DMA) in Piano Pedagogy from the University of South Carolina in Columbia. McCroskey taught Music Theory & Music Appreciation at Midlands College in Columbia for 17 years. Now officially retired, Chris is active in musical theatre, playing piano and substitute teaching, as well as being the organist and choir director for Trinity United Methodist Church in West Columbia, South Carolina.